Tim Harvey | How can we do things better by understanding the brain? It’s been a few years since I’ve done anything with this site. Yesterday was my last class of graduate school at the University of Colorado – Boulder (Master’s in Engineering Management, certificate in Technology Ventures and Product Management), so I think I’ll have more time to spend on here soon. I’m still working full time as a Global Product Manager for therapeutic medical devices, which is a great learning experience, purposeful, and mostly enjoyable. The job is basically exactly what I was looking for, and it’s where I should be for now. I’m generally happier pursuing at least one intellectually challenging activity outside of work, which helps to meet interesting people. I don’t know much yet. But this feels important. Also, over the next few months I’ll ski as much reasonably possible, and practice yoga whenever I can. I’ll also probably spend some more time in Asia for work. Love Colorado, also love to travel! I’m back on the job hunt! This time, I’m looking for a position in biology/healthcare innovation to build on my Master’s program at CU-Boulder. Classes are part time, online, and designed for engineers working full-time so I’m looking forward to finding a good fit. This page shows How I Can Add Value and what I’m looking for. You can also download My Resume, or find me on LinkedIn here. If you know of any positions, people I should talk to, or have any questions please let me know! Your pitch is often the first impression your company will make with an investor. The company can be amazing and if your pitch is still rough, your company looks rough too. When you are in front of VCs or angel investors you know it can make or break your fundraising efforts. Combining two of the most challenging things someone can take on (entrepreneurship and public speaking) your presentation can be anywhere between enlightening and embarrassing for both you and everyone in the audience. Here are some ways I see people screw up the pitch of otherwise good startups. This isn’t an exhaustive list, just the most exhausting things I see on a regular basis. I’m only talking about the pitch itself here; assuming that you have a company with a real product, a solid team, and traction in the market. You know what you’re asking for, your valuation is reasonable and defensible, and you don’tlook like an idiot. Perhaps you even have over a million dollars in revenue and strategic partnerships in place – even those companies can mess it up. Whatever the case, you’ll probably have a short 5 -15 minutes on stage, and only a few slides (at most) to make a first impression. Don’t blow it! Be mindful of what the audience is here for, and you have a much better shot at closing your round. Too narrow of a talk. Frame the problem you’re solving and why it’s important, and go from there. Hold off on the technical aspects – while they may be easy for you to talk about, it’s not so easy for someone who hasn’t heard of your startup to understand. Most of the time, scientific or detailed answers are best left to the Q&A, or (even better) one on one with the prospective investor after the pitch. Get out of you own head, and make sure you put your idea in context of the problem you’re solving and the ecosystem in which it operates. Forgetting what investors do. Keep in mind that they are investors, so they want to hear about the investment. Unfortunately, that sense in that isn’t as common as it should be. Know what investors want to accomplish, and learn from CEO’s who have raised and exited successfully before. Understand your valuation and think about the exit, because that’s how investors get paid, and many entrepreneurs forget that. Talking about the cool idea you have without any numbers to back it up might work with an unexperienced angel or a rich uncle, but it won’t work with people who know what they’re doing. Acting like you’re in business class. Avoid industry-specific jargon and MBA-speak. Your audience is smart, but it’s your job to make sure they can understand you. They may have already heard 20 pitches that day, with the same acronym in 3 different contexts, and once you lose their attention it’s very tough to get it back. Also, trying to appear impressive with something other than actual accomplishments may give the audience a signal that you’re not coachable, which is a big red flag. Investors also won’t care about your 50-page business plan like a marketing professor would – be concise (in large font) in your deck and save the business plan for due diligence. Not practicing enough. It’s okay to feel nervous about the pitch. It is not okay to ignore what makes you nervous. The single best thing you can do to reduce fear is by practicing what you’re going to say, many times over. Practice on your own, in the mirror, and in front of real people. I joined Toastmasters when my career led me to frequent public speaking, and it’s the best thing I could’ve done to improve my presentations. Public speaking wasn’t brand new to me (I had probably spoken to over 1,000 people in public at that point) but the difference I saw was dramatic. I’m still not an expert, but it was a steep and useful learning curve. Not all CEOs will have the time to join a public speaking group, but you at least need to dedicate ample time to practice. No feedback. Learn all that you can from your practice. Record yourself on video and watch it – it’s probably humbling. Feedback from other people is extremely valuable as well. Toastmasters does a great job of this (on the technical speaking points) and it’s one of the most best parts of the program. Rarely in life are we given honest, realistic feedback (even if it stings) so soak it up when you can. Ask knowledgeable people in the industry like angels or other CEOs to watch and critique both your business and the presentation. If you’re able to get a pitch coach to work with you through the process, be thankful and take advantage of it. Overall, make an effort to be more aware of what your investors are looking for, and how you communicate most effectively on stage. If you’ve gotten to the point where everything else in your business is solid enough that the only thing holding it back is the pitch, consider yourself lucky. This isn’t an easy process, so learn as much as you can. Then go out, get more feedback and practice, and keep polishing! Jon Weston is convinced that his company’s product can help take away pain, help the body heal twice as fast in some cases, and even save lives. It is particularly interesting to see a former pharmaceutical executive get so excited about a non-drug, non-invasive therapy that helps people use less medication. After I saw him pitch, I had to find out more. I had heard of (and played with) infrared light therapy before, since my father, a MD in Michigan, had been using another device in his practice for the better part of the last year. He’s been finding profound and sometimes unexpected success, especially in curbing or curing a variety of chronic ailments for patients who weren’t responding effectively to traditional medicine. My mom tried it on her arthritic hands, and the pain all but disappeared after a few weeks of sessions. My dad calls pretty frequently to talk about the latest treatment or a cool new medical device, but it meant more to hear my mom talk about how a light therapy took away pain that has invaded her life for years. While that device certainly helped people heal well, they have some limitations. They’re not as easy to use, and not cheap, either – the units he’s purchased have cost over $2,000 per light. BioCare’s product was entirely different from the other infrared treatment devices I’ve seen (and dramatically less expensive) so I had to take a closer look. I gave Jon a call to hear about it in more detail, and we were able to grab coffee by DU, where he got his MBA, and I got my bachelor’s degree. He is a molecular biologist by training; a former pharmaceutical executive who spent years bringing products from R&D to market for companies like Searle (now Pfizer) and Gambro. While some of these medications went on to do very well, he’s convinced that infrared can be safer and more effective than traditional drugs for some problems. A number of years ago he met BioCare co-founder and Chairman Sherry Fox, who worked with her late husband (a biomedical engineer with 15 patents) to develop the initial technology for the LumiWave. Jon came on board as COO in 2005, and stepped into the CEO role in 2009. It’s no secret that medical device companies need a longer runway than other startups due to the intensive R&D process. Techstars CEO David Cohen joked at a Silicon Flatirons event this week about a “17 year accelerator” if they were to have one in the biotech industry. Many investors aren’t comfortable with or don’t understand the R&D process, so thankfully BioCare has been able to bootstrap the company so far. Before opening it up to investors, they wanted to make sure the biggest risks were taken care of – the technology was sound, real units were selling and being used extensively, and strategic partnerships were in place. They’ve also had the chance to acquire patents, an over-the-counter FDA clearance, and they’re sailing toward the next approval level. Their patents and years of progress in these areas provide particularly high barriers to entry for even large medical device companies. While IP is great, it doesn’t make money… well, until it actually makes money. That’s why it’s so valuable to have product sales and revenue while rounding out the R&D process. Aligning with lean startup practices, they signed high value, paying customers (who generated real market feedback) as early as they could. They’ve made some pivots, and their open-mindedness has allowed them to find some of the fastest growing sectors of their potential market. It can be both a blessing and a curse to have a product that can be used so widely. Pinpointing not just the largest markets, but the ones most motivated to act on their literal pain points was of key importance. Perhaps the most common use of infrared light therapy is for the treatment of osteoarthritis or other types of chronic pain, like my mom had, so that was BioCare’s first major application. While the chronic pain segment may have the largest number of people and dollars in it, Jon saw early on that the only way to really make a difference there is with widespread adoption by the health insurance companies, not known for moving quickly and fairly preoccupied with legislative items at the moment. While the insurance companies are still moving toward adopting infrared, he wasn’t going to wait for permission. The sports medicine and physical therapy industry was another reasonable market choice, and once they tried, he saw considerable traction here. This segment is especially motivated to pay for faster healing times, especially at the highest levels of competition, where there is also often significant pain with injuries. Thankfully for BioCare, the U.S. Olympic Training Center in Colorado Springs was only a short drive from Denver, and the Olympians took to it very quickly. The effects were so dramatic and positive that the Manager of Sports Medicine and Training for the US Olympic Centers offered to be on BioCare’s advisory board. She’s joined on the board with others who have volunteered after seeing the device in action – a few top orthopedic surgeons, three professors of medicine, and a trainer for the US Naval Academy, among others. For the treatment of traumatic brain injury (TBI) BioCare is partnering with Cerescan, an industry leading, Denver-based brain imaging company. I was able to tour Cerescan with CEO John Kelley, who told me they have tested literally a team’s worth of NFL players for the diagnosis of TBI, some after suicide attempts. There is another group terribly affected by TBI – our nation’s military. BioCare and Cerescan joined with the Tug McGraw Foundation for theInvisible Brain Injury Project to study just that. This project will continue remarkable pilot testing they’ve done with veterans so far. The military experience often adds a dangerous element to a volatile situation in the brain – the high prevalence of PTSD upon returning from service. The number of deaths from combat is horrifying and significant – and the increasing number of veterans who take their own life is a sad, and unfortunately frequent tragedy. It is made worse by being poorly understood, with few effective treatments and no real cures available – so far. In the initial round of testing, they’ve seen remarkable success with every patient they’ve tried it on. One particularly moving story involved a vet with TBI, PTSD, and a few recent suicide attempts. After a brain scan confirmed his neurological issues, and then a number of weeks in treatment, he was off all of his psychiatric medications. He had a follow-up scan, and then went back to work for the first time in a year and a half. Other participants have had similar stories, and while this treatment still needs to be validated in a study with a larger sample size, all signs are pointing in the right direction. If these treatments continue to work so effectively, how much value will someone place on getting their life back? What will the family think as they watch a loved one go from nearly dead to “feeling like their old self again”? I see a fair number of startup pitches. Most have at least pretty good ideas, and nearly every entrepreneur projects a hockey stick-shaped growth. A few have the chance for real traction, and it’s rare to find a company that claims such a big impact on the real quality of life for its customers. Biotech is hard to launch, but when it works, it can returnbig. It will certainly be interesting to follow BioCare as they attempt to change the world by healing the people in it. This week, Fusion-io acquired Louisville, CO based NexGen Storage for $119 million. The next day, I had a chance to sit down with venture capitalist Kirk Holland of Access Venture Partners, who was also on NexGen’s board. Access Venture Partners co-led the $2 million series A round with Grotech Ventures, and Next World Capital later led the$10 million series B.
NexGen founders John Spiers and Kelly Long have been around the venture capital circuit before – they were co-founders of Boulder-based data storage company LeftHand Networks, which sold to Hewlett-Packard in 2008 for $360 million. A few years later, they again had a vision for a better data storage technology and started from scratch. This time around, solid-state disk drives and cloud infrastructure were ever more important, and they developed their product from the beginning with these ideas in mind, building it to intrinsically protect their competitive advantage. John and Kelly bootstrapped NexGen to get started in 2010, and reached out to Kirk regarding venture funding after about 6 months. Due diligence meetings, which went on for a few months, were held in Kelly’s basement where they first hatched the idea of NexGen – and a few short years later the $12 million in capital turned into an acquisition nearly 10X that amount. The exit was faster than expected, but they thought the terms were great and they were excited to work with Fusion-io. Kirk’s previous firm, Vista Ventures in Boulder, began investing in LeftHand in 2001 so he had the chance to get to know John and Kelly over many years. He was impressed with the team more than 10 years ago, so in this deal he said “working with John and Kelly took the team risk off the table.” Given this strong relationship and the fact that LeftHand had one of the biggest VC exits Colorado has seen, they were ready to do it again. “The industry was pretty crowded when we made the investment,” Kirk said, with both venture-backed and big name tech companies all trying to do the next big thing in data storage. He thought NexGen’s technology could leapfrog the other products, and the experts Access Venture Partners brought in for due diligence confirmed that. “They were really passionate about building a great, sustainable business. NexGen reinforced the idea of working with trusted relationships,” Kirk said. Access Venture Partners is a big name in the Colorado venture capital landscape. This is the second fund they’ve closed, and the MD’s there have invested over $100 million in more than 50 technology startups so far. These companies as a group have gone on to raise over $1.1 billion in additional capital, growing revenue 15X since initial investment, and creating over 3500 high paying jobs in Colorado. AVP currently has 20 companies in their active portfolio, with 19 successful exits. Their focus is on high-margin technology businesses in large or rapidly growing markets, especially in data security/storage, cloud computing, and digital media/consumer internet businesses. They lead the vast majority of fundraising rounds they participate in, and while sometimes that means writing the largest check, they also lead by investing first and getting other VC firms on board. They also like to work closely with entrepreneurs after the investment is made, often taking a board seat and using their connections to help place key executive talent, as they did with NexGen. Big exits, especially in the 9-figure range like NexGen, are going to really help put Colorado on the VC map. While Boulder may be famous from investors like Brad Feld and TechStars, Kirk believes there is a shortage of early-stage capital in the area. “Early-stage investment has dropped in Colorado over the last 5-10 years as VC’s didn’t raise follow-on funds, while the number of young companies has grown”, he says. Venture capital isn’t limited to state lines, but it’s certainly helpful to have investors nearby. Fusion-io actually has offices just miles from NexGen, so this acquisition was sort of in their backyard as well. The universities in the area (CU, DU, CSU, Mines) attract technology and engineering talent, and many of the students that come to Colorado don’t want to leave after graduation. That’s what happened to me, and even though skiing might’ve been my excuse to move here when I was 18, it’s the people and the startup community (and the weather) that have keep me here. These schools also have close connections to the startup community, through groups like CU’s Deming Center for Entrepreneurship, and Colorado School of Mines’Technology Transfer program to help students commercialize their inventions. Big players like Google, Microsoft, and Oracle are also importing talent by adding to their already-large ranks in Colorado. “The people here are very motivated and passionate about what they do,” Kirk says, “without the focus on a quick buck that leads to higher employee turnover rates” that concerned him with some companies he saw in the Bay Area. Colorado is also a less expensive place to build a business than anywhere in the big coastal cities, and still has solid venture capital groups like VCIR, Rockies Venture Club, as well as the sweetheart of Boulder, TechStars. Although April was a great month for Colorado VC-backed firms, we have to keep innovating and building great companies to strengthen the region. More investment capital will certainly help – but it’s the people here that drive entrepreneurial success. I stand over the cornice, gazing down at the next couple thousand feed of mountain that is my chosen challenge. The crisp air and perfectly blue sunny day beckon me to enjoy the scenery of the Rockies for just a moment more. A moment passes and I consider whether I’m procrastinating the ledge I have to drop off before I hit the snow. My friends go forth, one by one, and a big plume of Colorado powder puffs up as they race down the double black diamond run in Vail. I take a few seconds to analyze the potential path in front of me. Just a few rocks and trees to avoid at the top, and a steep, 35 degree incline to manage until we get to the trees below. I feel the anticipation and slight nervousness as I point my ski tips off the ledge. No stopping now. One moment’s hesitation, one indecisive move, or letting my fear control me, and I’m done. It’s been a long powder day and my legs hurt. My quads are tight and my hamstrings have been complaining to me for hours. Still, I can’t get lazy. The moment I let my mind or my legs relax in a turn may be the moment inertia allows me to fly into a tree. As I focus and let myself live in the moment, the muscle tension, the fear, and the worries of life melt away as I cut a low amplitude waveform S curve into the untracked powder. Skiing has been a passion of mine for almost 14 years now. I began at a tiny hill in Michigan, and once I came out to Colorado with my family I was hooked. I visited the University of Denver for a college tour (at the beginning of a ski trip) and the sight of the mountains from the freshman dorms was the instant that sealed the deal on where I was to go to college. Many factors went into my decision to attend DU: A well developed Cognitive Neuroscience program, a small but engaged student population, a city with an international population, and of course – skiing. I probably made the final decision on where to attend on an emotional basis, like most decisions are made, and I was able to justify with logic what allowed me to pursue a passion of mine throughout my undergraduate career and beyond. Skiing has a great social aspect. Many, maybe most, of my best friends in Colorado are accomplished skiers. I’m happy to be able to keep up with them most of the time, as they’re often ski instructors, former professional skiers, or others possibly even more passionate about the sport. It is an individual sport often done (recreationally) in groups, and you are always responsible for yourself. Surrounding myself with skilled people who constantly push me to challenge myself is a constant reminder of what I need to do in my personal and professional life. Most people can have fun on a moderately sloped, groomed run – but the real prize is found really getting out there. The rewarding runs and snow are not found where most people go, where the crowds scrape off the snow and the kids learn how to go from pizza to french fry. The best runs, the ones you feel the most content skiing, are far off the beaten path. You may have to hike there, and you may encounter some things you didn’t expect – but that’s part of the fun. Whether you have to manage a steep incline or feet of powder through densely wooded areas, the challenge is really what makes the run. The time I spend on the mountain and the rhythm I find cutting turns really allows me to step away and look at my life from a different perspective. Many corollaries can be drawn to what it takes to be successful in life. You must constantly challenge yourself and surround yourself with supportive people who will push your comfort levels. You have to live in the moment and pay close attention or you’ll lose your footing and may hurt yourself. Get away from the easily accessible areas and you’ll discover the joy of untracked snow and the reward of getting out there. And perhaps most importantly – enjoy where you are. Be present, because this moment is all we have right now and because it frees the soul. 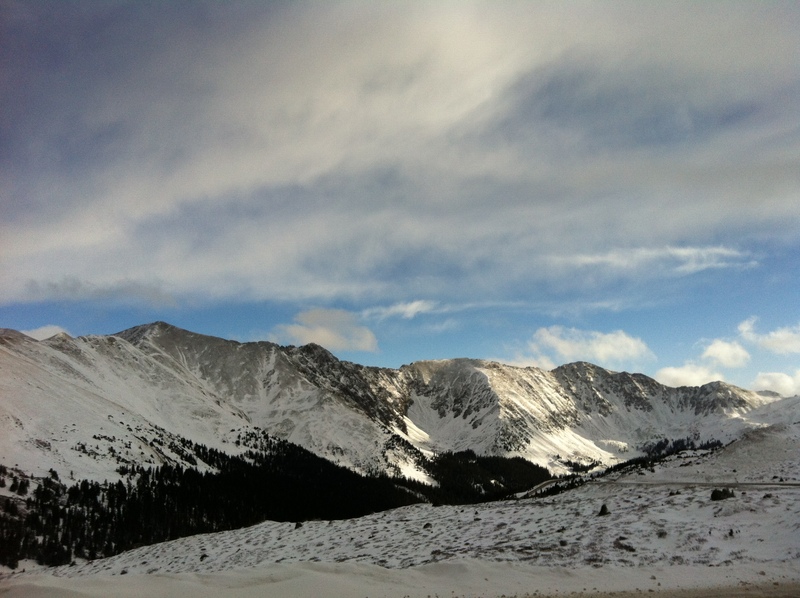 Take time to appreciate the natural beauty and the perspective of seeing the world from above the tree line. And be thankful that you can be out there, around good people, doing something that ignites your passions in life.